Found on the MicrostockGroup Forum Topic: Mostphotos launches web price and subs, I reprise the news of the Mostphotos new pricing plans. Most contributors are saying that the main usage of Mostphotos is for backup purpose because selling volume there are going very low and that they don't want to sell their hi-res images at subscription prices. New plans to add buyer appeal and an opt-out setting for the contributors are now available. Mostphotos has now more than 1 million images and 21500+ photographers. Here the plans with the Medium recommended option at the same price of a 25-a-day Shutterstock subscription but with 30 images. 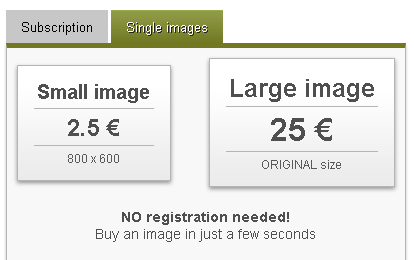 Until now Mostphotos has offered one way to buy photos and that has been single purchases via credit-card. We have seen that most of our customers are one time visitors dropping in via search engines such as Google. They are obviously looking for a certain specific image and we have luckily hit on their search result. That is excellent and that is why we constantly are working on our SEO (search engine optimizations). For instance we have a big translation project going on. It’s about making all the images searchable on multi languages and site translations so we can present a very local appearance when ever buyers visit Mostphotos. This is all part of the SEO projects that we have ongoing. But we have seen that it’s hard to keep hold on the customers dropping in via Google. It has been difficult for us to turn them to regulars and that is mainly because of the pricing. Most comments we have been getting is “why become a regular at Mostphotos when I can get much cheeper images on other sites”. That is why we decided to add two new features. We have during the past month worked on improving the e-commerce and finally we have a system that supports sales of web resolution images and subscriptions. 1) As logged in customer via subscription, creditcard or invoice. 2) As logged out customer (quick buy) via creditcard, no registration. For one time customers dropping in via Google. If we look closer at the fact of “Why choose us” we will see that it is mostly because we have images that buyers cant find else where. As a consequence of our democratic approach, we have been selling images that wouldn’t make the review on most stock-agencies out there. This business model gives us therefore an everyday challenge with our automated sorting and rating algorithms. That is the uniqueness of the site. 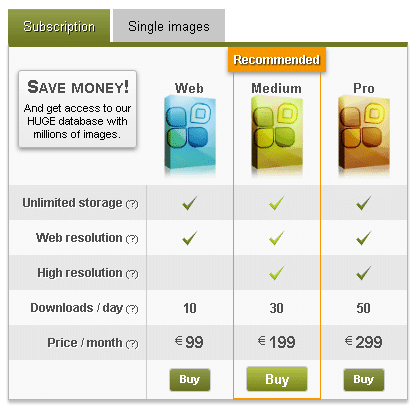 For example if a buyer buys a subscription for 200€/month. 200€ / 10 images * 50% commission = 10€ to each photographer. The subscription will go on every month and automatically debit the purchasers bank account. Our marketing research shows that customers in general uses subscriptions less for every month that goes by. In the beginning they are eager but in a rather short time the availability calms them down. The human psychology works like this. Subscription is not for us something that is written in the stones and for ever. But now that our system supports subscriptions, it is a smart move to try it out. We believe it will work and will give us the strength to attract more frequent buyers. Time will tell how it will go with this. The subscription plans are something we just put online. No fuzz or marketing has been made yet. There is an option out setting for those who don’t want to be a part of our subscription ventures. The setting can be found in the setting page → site → subscription settings.